Ten-Year Veteran	 The grille that set the car design world aflutter is gone, replaced by one similar to other Audis. Ten-Year Veteran	 A steering wheel switch toggles to this more conventional layout. 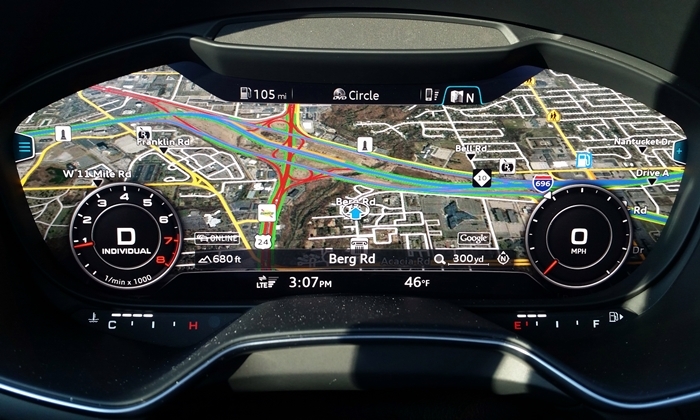 Better for driving, if not nav. Ten-Year Veteran	 Audi designers cleverly located the HVAC and seat heater controls in the centers of the air vents. Ten-Year Veteran	 Optional S Sport seats are unusually comfortable and supportive. Loved them. Ten-Year Veteran	 Very tight. My pre-teen fit. Yours might not. Ten-Year Veteran	 You can fit quite a load into the TT even without folding the rear seat. Ten-Year Veteran	 The floor is flat. The cargo net only makes it look bowl-shaped in this photo. Ten-Year Veteran	 Plentiful cargo space with the rear seat folded. Many owners probably leave it this way. Ten-Year Veteran	 The four-rings on the engine cover distinguish this 2.0T from that in the VW GTI. Ten-Year Veteran	 Early photographs included this view. 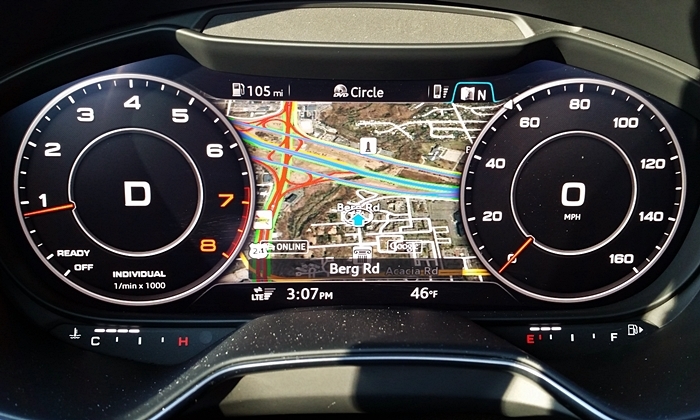 It maximizes the nav map but the virtual gauges look silly. Ten-Year Veteran	 I personally like the minimalist, driver-centric controls, but the passenger could feel left out. 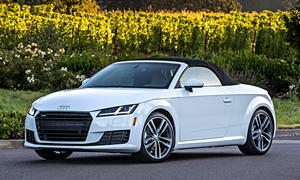 Ten-Year Veteran	 Crisper lines lend a leaner appearance to the redesigned Audi TT, and it does weigh less. Ten-Year Veteran	 Same iconic shape, but with less curvy curves and more angles. Ten-Year Veteran	 Earlier generations were rounder, especially in the nose. Note the grille shape. Ten-Year Veteran	 The rear quarter view hasn't changed as much. As elegant as ever. Spoiler pops up at speed. Ten-Year Veteran	 No retro here. Ultra-modern, minimalist interior design. Ten-Year Veteran	 The previous car's interior had a small display in the center stack. Not suitable for 2016. Ten-Year Veteran	 Real aluminum trim livens up what would otherwise be a coal bin. Ten-Year Veteran	 Audi has done little to make the 2.0T engine pretty without a cover. Quick, but not thrilling.